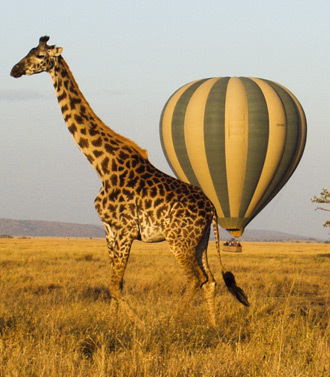 In Kiswahili the word Safari, from its Arabic root, means "Journey". A single step can begin one of the most magnificent journeys of your life. Your journey of a thousand smiles. THE SERENGETI, NGORONGORO CRATER, TARANGIRIE, LAKE MANYARA, OLDUVAI GORGE... these are just some of the East African Safari locations EAO Adventures, Ltd. can take you. You choose your level of comfort in accommodations from CAMPING SAFARIS TO LUXURY LODGE SAFARIS, or any combination thereof. Our private camping safaris, based in deluxe tented private camps are complete with delicious, full course meals prepared by your own private chef. 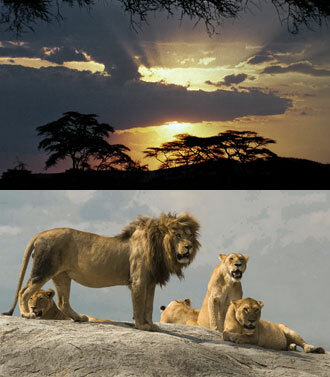 We can design a safari adventure for you ranging from 3 days to 30 days and beyond. Or, you can sign up for our recommended CLIMB AND SAFARIpackage which takes you first on an 8 day / 7 night climb to the top of Mount Kilimanjaro, followed by a 5 day safari to the historic Olduvai Gorge and famous game watching areas including Ngnorongoro Crater, Lake Manyara and the Serengeti (or Tarangirie... depending on the season) National Park. We'll take you where you will have the greatest opportunity to of see as many different game as possible. 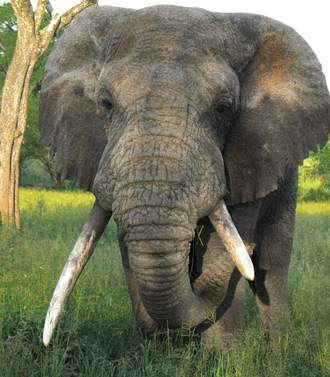 Leave Arusha for Lake Manyara Park and half day of game viewing. Overnight at luxurious Serena Manyara/Ngorongoro Lodge. Full day game dirve in Ngorongoro Crater. Picnic lunch in the Crater. Dinner and overnight at Serena Ngorongoro Lodge. After breakfast we check out of the Lodge and depart for the plains, with a stop off at Olduvai Gorge.Olduvai is the excavation site of the oldest human remains ever discovered. After exploring Olduvai, we continue on to our deluxe tent private camp. Game viewing is possible along the way. We arrive at camp, settle in and go game viewing in the afternoon while your private chef prepares dinner. At night you'll retire to your tent to be serenaded by the calls of the Lions and Hyenas. The next morning we rise early and drive to set up breakfast near the river among the Crocodiles and Hippos. Full day of game viewing with lunch also on the plain. Back to camp in the afternoon for a rest and siesta, then back out in the afternoon for a sunset game viewing drive before dinner. Breakfast and morning game drive before departing back to Arusha, lunch upon arrival.